Durham City is served by three Park and Ride sites on the key routes into the city. These are situated at Belmont, Sniperley and Howlands. A direct bus service runs every 10 minutes to the city centre from each site. The sites offer free parking for users of the Park and Ride bus service and unlimited daily travel into the city centre and back for just £2.00 per person. Park and Ride users can also use the Cathedral Bus for free. Much of the city is accessible within minutes. 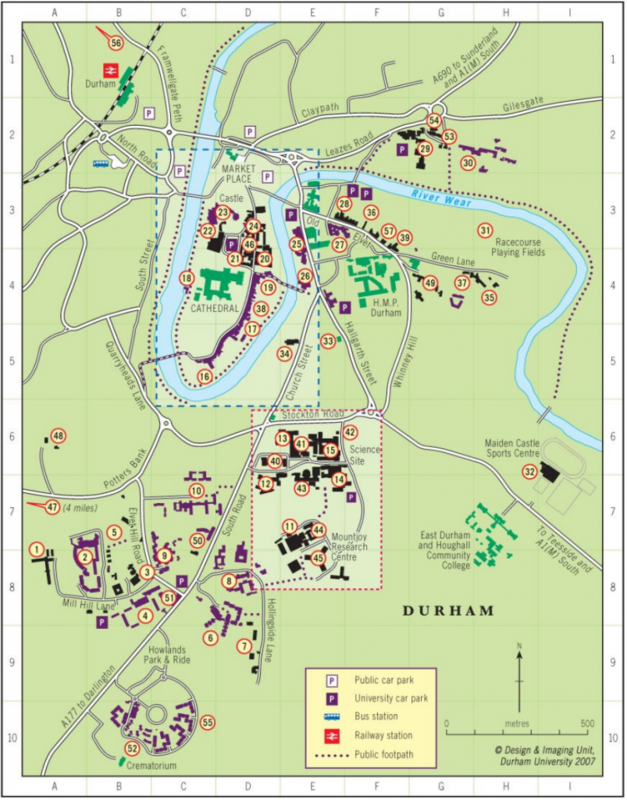 For example, Stephenson College (number 55 below) to the castle (number 23 below) is about 20 minutes’ walk. Bikes can be hired in the city to offer a cost effective way to get around.